Kitchen remodeling is consistently one of the top two home remodeling projects next to bathroom remodeling. One of the many reasons for this is that remodeling your kitchen offers great potential for your return on investment. 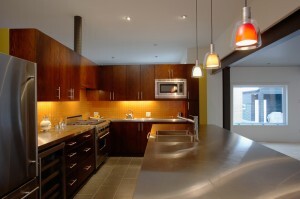 According to Remodeling Magazine, a major kitchen remodel stands to recoup 74.2% of the costs that went into it. A minor kitchen remodel does even better at 82.7%, which is great news for homeowners looking to make a smaller commitment. Of course, as a homeowner, you have to take the right steps to achieve these numbers if you’re interested in maximizing your return on investment. Keep the following tips in mind when remodeling your kitchen for the best return on your investment. Rome wasn’t built in a day, and you can’t plan a kitchen remodel in a short time period either. You should spend about 6 months planning your kitchen remodel. This does several things. First, in six months you’ll be able to nail down exactly what you want out of your kitchen, which reduces the chances you’ll change your mind during construction. You can also choose the fixtures and materials you want beforehand so you can get more accurate bids from contractors. You might also consider enlisting the help of a professional designer during this phase. The footprint is the general placement of major kitchen components such as appliances, the sink, and cabinets. Moving these around often requires moving gas and water lines with them, which gets expensive. Speaking of appliances, unless you’re a sous chef, stick with realistic appliance expectations. Commercial-grade appliances may have their place if you’re looking to do some serious cooking, but consumer-grade stuff works for most purposes. Lighting is an important component of your kitchen, and has a lot of value in that depending on how you use it, you can really alter the appearance of the kitchen. Make sure you have adequate task lighting (i.e., lighting under cabinets that lights up the countertop, sink, and other prep areas) as well as ambient lighting with dimmer switches to change up the mood. Cheap components might seem attractive for their price-point, but they won’t add value to your kitchen if they’re not built to last. Go for good quality countertops, flooring, and cabinets that will last for years. Storage space will always be valuable in a kitchen. Cabinets that reach to the ceiling take advantage of valuable space that otherwise would have been wasted. This entry was posted on Thursday, August 21st, 2014	at 4:09 pm	. You can follow any responses to this entry through the RSS 2.0	feed. Both comments and pings are currently closed.